Concord General Baptist Church - Pastor Page - Wow! 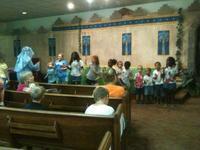 What an Awesome VBS! Wow! What an awesome VBS program we just finished at Concord General Baptist Church. God met us in a mighty way and we had visitors every night and the kids were really into the Daniel's Babylon Experience theme. I want to thank all the workers and all the volunteers that brought food each night and made our VBS a true success. I also want to give a special thanks to Howard and Cheryl Green for all their support and awesome job in building the incredible set of the Babylon Palace. I also want to say great job to Carol Byers, who put endless hours into pulling everything together. This was definitely the best VBS I have ever been a part of in my many years of ministry. Thanks to the entire Church family. I know God did a marvelous work through everyone this past week. We serve an awesome God and through Him all things are possible! Have a blessed week!